I found this recipe in this month's issue of Good Housekeeping! It was delicious, easy, and healthy! I didn't do the Brussels sprouts though - ick! 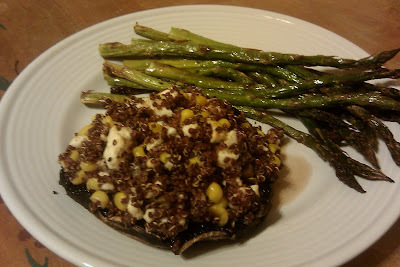 I roasted asparagus instead - yum! Preheat oven to 450 degrees F. In 2-quart saucepan, combine quinoa and 3/4 cup water. Heat to boiling on high; reduce heat to medium-low. Cover and cook 15 minutes or until liquid is absorbed. Meanwhile, trim and halve sprouts. In an 18-inch by 12-inch jelly-roll pan, toss sprouts, 2 teaspoons oil, and 1/4 teaspoon each salt and freshly ground black pepper to evenly coat. Roast 10 minutes. While sprouts cook, brush mushrooms with remaining 2 teaspoons oil and sprinkle with 1/8 teaspoon salt. Finely chop thyme and add to medium bowl along with corn, feta, cumin, and cooked quinoa. When sprouts have roasted 10 minutes, push to one side of pan and arrange mushrooms, gill side up, on other side. Divide quinoa mixture among mushrooms; roast 10 minutes or until mushrooms are tender.